Thinner than 2 mm. The softness and thickness is similar to the mouse pad, not easy to break and can be rolled. Active area is 160*120mm, 4000 LPI resolution and 200 PPS report rate. Appropriate size and sensitivity make the pen tablet work better than a real mouse to play game. FLEX AND ULTRATHIN DESIGN -- Thickness of drawing area is only 2mm, similar to the mouse pad. S56K tablet is so soft to be rolled up, easy to bring and ideal for flexible workplace. 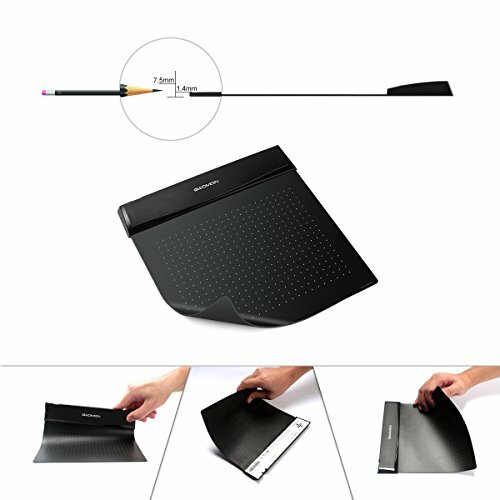 ANTI-SLIP MAT -- The back of graphics tablet equips with anti-slip mat, not easy to move when you use. FOR GAMES -- Suitable for OSU, Draw Something, rhythm games and other games which can be play with mouse. It is faster and smoother than using mouse. GAOMON DIGITAL PEN --- 2048 levels pen pressure sensitivity which makes you control the thickness, transparency and color of the line naturally and smoothly like a real pen. There are 2 buttons which can be customized as you like. (AAA battery is necessary). If you have any questions about this product by GAOMON, contact us by completing and submitting the form below. If you are looking for a specif part number, please include it with your message.